Go check out this terrific article about members of the NaturalKids Team! 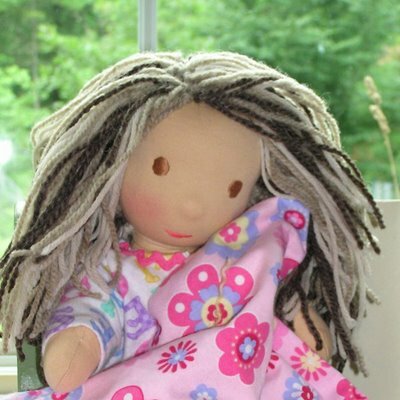 Today’s interview is with the co owners, Cat and Dodi, of MaDau Creations whose lovely Waldorf dolls have a certain joyful innocence about them that is so wonderful to see. So let’s get to know them a little better…. MaDau Creations is a Mother & Daughter Team consisting of Dodi Moody and her daughter Cat Macri. We began MaDau Creations by creating items for Cat’s children for Christmas. Friends and family then asked for similar items, we grew from there and hopefully will continue to grow in the Etsy community. Dodi has been crafty her whole life, she paints, sews, does a multitude of things with fiber arts, scrapbooks and makes cards. Cat dabbles in many mediums; drawing, painting, scrapbooking, digital scrapbooking, desktop publishing, crocheting, knitting and felting. She just likes to experiment with her creativity and searches out new ways to express herself often. 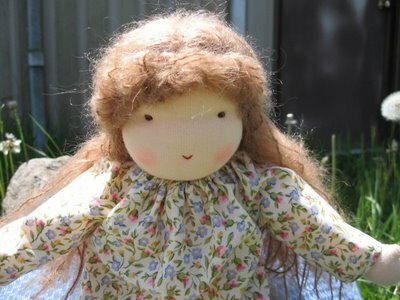 Currently in our Etsy store we sell Waldorf Style dolls and accessories. 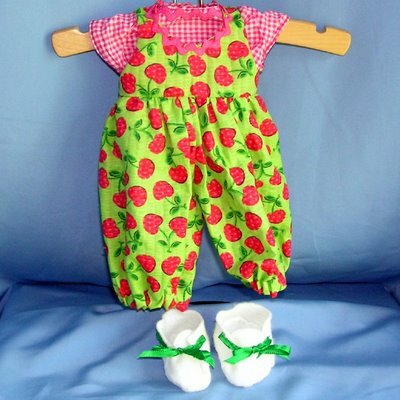 We have a variety of different sized dolls listed as well as clothing for those dolls. Dodi paints all kinds of decorative items and has another business called Pretty Wooden Plates. Cat knits, crochets, weaves and creates items of magic wool for her children during the home schooling day. We both are very busy creating something most days though you won’t often see our handiwork on Etsy. Currently our Etsy creations are fixated on Dolls. Cat’s children are really instrumental in developing new ideas for our creations. They play and pick up something and request that we help them make say a cat or doll and next week that item is in the project of our home schooling week. If it inspires further creative juices we go from there. Our Princess and the Pea doll was inspired by a game we play at home called “Sleepy Princess and the Pea” we had been reading the fairy tale and the kids asked to play this game we have from Haba toys. Later I noticed them playing with pillows and a doll we had made them for Christmas and acting out the story. Dodi thought Wow what a great doll idea and we ran with it from there. Books, nature, my children’s imaginative play, other etsian artists. There are so many fellow NaturalKids Team members with grand imaginations they inspire me to work hard. Alpaca & Angora! For dolls we stick to wool, cotton and silk. Sometimes we use bamboo and other exotics but we are hoping to make something warm and cozy with Alpaca wool or Angora soon! They are just so soft! Keep at it. Advertise your shop with your friends and family, through email correspondence just by signing all your email correspondence with your etsy shop name and link. Perhaps join in coop advertising with your team members and relist your items often. That is the advice I have been given by Natural Kids Team member, Blossombabies, and I am trying to keep at it. It is hard work and takes time to get it right but once you get the hang of it you’ll be able to make some beautiful creations. Make mistakes, get your hands dirty, mistakes spawn grand ideas and new ways to do things so don’t be afraid to make them. I hope you enjoyed meeting Cat and Dodi, I certainly did! Today we get to meet Allessandra, of lalaspequenos , whose shop is full of some of the coolest kids clothes I’ve ever seen! Her bright colors, beautiful natural fabrics, and fabulous designs are really something to see…so here we go! Growing up in Costa Rica, my grandmother was the center of the universe for me. Of course my parents were part of that too but it was my grandmother’s infamous “teas” that led me down a crafty path. During those teas, which looked more like knitting circles, I learned about life. Discussions about children, grandchildren, nieces and nephews, recent marriages, awful divorces, and who made what recipe for whom, carried the afternoons into the evening. So it was that in between talking about Elena’s knee operation and my aunt’s graduation that my six-year-old hands learned to knit. Knitting turned into crocheting, crocheting turned into sewing, appliquéing, stuffing, embroidering, quilting, and all around fooling with fabric. To me, crafting is a necessity and part of my social upbringing. It is part of the day like brushing teeth or combing hair. It is a time to learn about life, and now with my own children, to teach about life. I also make girls and baby clothing. In which case I pretend I had a little girl and go to town! I have a sewing mentor here in the states and she is so knowledgeable about techniques, fabrics, machines- I am so happy to have found her! Honestly – everywhere! I live an hour from Washington, DC and have access to wonderful museums, libraries, parks, and here in the woods – Nature! My inspiration can come from a beautiful fabric scrap or looking at designs from the past. Currently, I found the most wonderful organic Sherpa fabric and have been having the most fun working with it. But I’ll use anything that will help me achieve the look I’m going for. Go for it! There is nothing more pleasing than to share your work with the world. Get out there and make connections with other sellers. Etsy is a wonderful venue for new sellers because there is information everywhere! Join a team or even start one. The support you can get is priceless. Make sure that you get the technique down first. It’s like planting a tree. If the roots aren’t properly rooted, it will not grow very well. It will always struggle. www.lalaspequenos.etsy.com and the name is Lala’s Pequenos. I welcome everyone to visit my shop and say hello! 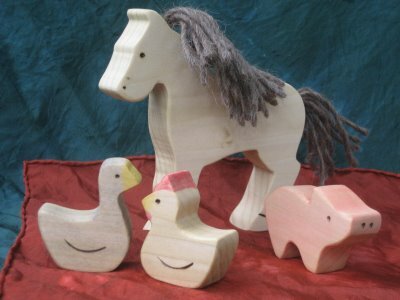 The main things I sell in my shop are wooden toys. I started wood working long ago. Four years, but got into making things with a scroll saw over two years ago. When I discovered nature tables, I couldn’t afford the sweet wooden animals from the German companies so I asked for a scroll saw for my birthday and received it! I have been making the fox, raccoon, skunk and mole with the same template I hand drew then. I make all my own templates. Drawing is something I do in my spare time. I hope to soon to share some of my drawings on Etsy too. I also knit and make stamps. I make books for my kids and sew. Who if anyone has been instrumental in helping you hone your craft? Where do you get your inspiration? My children. Often a new design comes from those eager little voices asking for mommy to make this or that. The griffin and phoenix were a request from my son Lucas. My children always get the first of anything I make. Also inspiration comes from the natural world and my innate desire to always create and always challenge myself to take it a step further. It helps to be selling as well 🙂 This always keeps me going, knowing that my work is appreciated and loved. I love being a part of heirloom toy making. I think often about all the neat toys my grandchildren will have that my children played with and loved. Some I made and some they made. I enjoy doing this for other families as well. I LOVE to work with wood. My drawing abilities come shining through in a three dimensional work. That’s neat. I also like to knit and sew. Take it slow and enjoy the process. It’s a wonderful feeling to find yourself through art, if you are true to the process. Take it slow. Don’t let the scroll saw intimidate you. Buy the good stuff. Well let’s see, my name is Kelley Zdziarski, though most people call me either Elfie or Elf and I live on a Christmas tree farm in northern Oregon. I have always loved making things for as long as I can remember, whether it was mud pies when I was a really little girl, or building tables and bird houses with my Dad when I was about six. I wanted to become a toymaker after seeing a Christmas cartoon about Santa growing up and making a bunch of toys to give to all the little kids. I saw that when I was little and wanted to make toys like Santa. Hahahaha. On my seventeenth birthday my Mom and Dad got me a Waldorf doll kit from Magic Cabin and that’s how I got started making natural dolls and toys. My shop is kind of split right now between needle felted items and Waldorf style dolls. The needle felted animals are the main items right now, but I plan on having more dolls done soon. I also have crocheted balls and pouches made of wool yarn and some wood working things as well, it’s really a mix of everything. My Mom and Dad have always been very supportive of me, which has helped a lot. If it wasn’t for Mom showing me how to work the sewing machine, I probably would not be where I am right now. I am mostly self taught, I’ve learned how to make all the dolls and felted critters just from reading books. Children’s books, old fairy tales, video games and nature are my biggest inspirations. I know, video games and Waldorf doesn’t seem to fit very well, does it? But there are a lot of lovely backgrounds in games and some of the cutest little critters as well. They are very fun to try and make. Oh, I love working with wool. There are so many different colors to pick from, it’s just wonderful. I also love cotton velour; it is my favorite material for making dolls. Most of the velour I use is a high cotton content blend as it’s very hard to find it in 100% form, though I do have some of that as well. If you already have a shop, just keep at it even if sales slow down. Keep making more and more things, have a positive attitude and don’t be afraid to try new things and ask questions. Be willing to take constructive criticism to help you do better, and remember, you can do anything if you put your mind to it. To those who are interested in opening a shop, I say go for it. Try and take pictures outside in natural light to get the best pictures possible. If you have questions or don’t know something, don’t be afraid to ask. When things sell, try and ship them as soon as possible as customers really like a speedy delivery. Try and package things so they’ll be memorable, using tissue paper and ribbons so it’s like your buyer is getting a present in the mail. It’s more likely you will be remembered if you make the customer feel special, so include a thank you note as well to let them know you appreciate their business. And again, be willing to take constructive criticism to help you do better. Natural Kids – FRONT PAGE of Etsy! Feeling some Etsy love……this treasury featuring many members of the Natural Kids team, was on Etsy’s front page last night….